Today Grandmaster Sergey Shipov provided commentary on the heavyweight clash in Bilbao between the current and ex-world champions. Vladimir Kramnik claimed an effortless draw, with his theoretical “excavations” causing Shipov to remark, in admiration: “For us, humans with spades, such large-scale work and bottomless pits look crazy”. Shipov’s original commentary in Russian, with a chessboard to see the analysis on, is at Crestbook. Hello dear chess fans and experts! Today along with me, Grandmaster Sergey Shipov, you’ll see the key game of the round, and perhaps the whole tournament. Anand and Kramnik are internationally recognised titans of chess who’ve already been competing against each other for 20 years. They’ve fought for the world title (and who knows, perhaps they will again), and it looks as though they’ll fight for first place in this tournament. Vladimir’s ahead at the moment with a 100% performance, and Vishy can only overtake him by winning their individual encounter. Having the white pieces is an excellent reason for aggression. No, no, I don’t want to give the impression that this current game will decide absolutely everything. After all, we’ve still got the second half to come in which, by the way, Anand will have white against the underachievers. The champion’s had an excellent start – 1.5 points in two “black” games. That’s a good foundation to build upon. 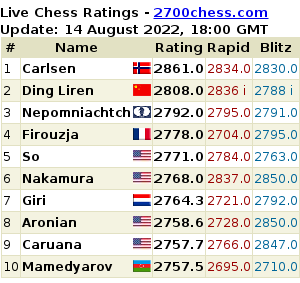 And of course you have to take into account Shirov and Carlsen – they’re capable of inflicting damage on the leaders. In general, there’s a lot to look forward to. But for now let’s watch the clash of the titans. 1. d4 We’re not going to see a duel in the Petroff. 4…dxc4 The most principled move. Black takes everything he can get his hands on. 5. 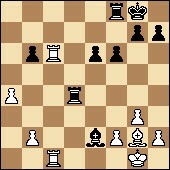 Bg2 Nc6 And by putting pressure on d4 tries to hold on to what he’s won. 6. Qa4 An attempt to reestablish the balance. 6…Bb4+ Combining development and support for the pawn. 7. 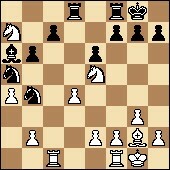 Bd2 Nd5 The knight’s going… either to b4, or to b6, with the same aim – to hold on to the pawn. Or to achieve favourable simplifications. 9. 0-0 One of many topical tracks. 9…Rb8 Holding on to the pawn with his claws. His claws! Threatening the b7-b5 push. 10. Na3 Repulsing the threat and creating the first, though not yet dangerous, attack on the key c4 pawn. 10…0-0 Right on time. For now 11. Nxc4? doesn’t work because of 11…b5. 11. Qb5 The queen’s zigzag is essential to win back the pawn. 11…b6 Black uses the travels of the white queen in his own selfish interests – successfully completing development and getting new points to attack. For example, the e2 pawn. 12. Qxc4 Ba6 13. Nb5 There’s nothing else. 13…Qd5 Forcing the queen exchange and new weaknesses in the white ranks. 15…Na5 The c7 pawn turns from a victim into a hunter. 16. 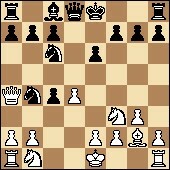 Ne5 White’s minor pieces rush to help the b5 knight. 16…Rbd8 A subtle move. The rook is eyeing the d4 pawn. 17. Nxa7! An overseas expedition for an exotic pawn. And the knight is perfectly capable of returning home via c6. 17…Nb4 Black also isn’t being idle. A few white pawns are already under attack. The grandmasters are playing quickly and surely. They obviously know the safe channels here. We can only watch and admire. 20. Rfc1 Played once more in line with the computer’s recommendations. 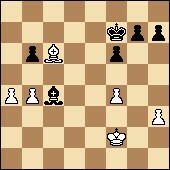 Two black pawns are under attack. The defence consists of active counterplay. 24. h3 Champions don’t blunder mating attacks on the first rank. 25…Rxd6 26. Rc6 The Indian maestro decided not to get fancy. What does white have in this bishop ending? Hopes of winning a bishop for a pawn on the queenside. But if black quickly centralises his king then realising those hopes will be problematic. 27…e5 No, Kramnik’s analysis turned out to be even deeper than I’d previously thought. I’m judging that by the clocks that show: 0.35 – 1.15! It’s simply some sort of monstrous immersion in theory, in the style of an excavator. For us, humans with spades, such large-scale work and bottomless pits look crazy. 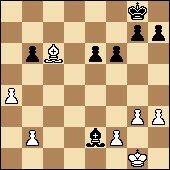 28. f4 Anand clears a path for the quickest possible centralisation of his king. The position’s one where every tempo matters. A race! It looks as though black is in time to organise a solid defence. 28…exf4 It would be risky to leave a weak pawn in the centre. Plus pawn exchanges are useful by themselves in order to achieve black’s aim. 29. gxf4 Kf7 30. Kf2 An important tempo has been won. But it’s unlikely that local achievement will grow into anything more. The passed pawn is just about to be created. 31…g5! And there’s black’s counterplay. The pawn ice is melting, and the turbulent brooks will wash away all Anand’s ambitions. 32. fxg5 fxg5 33. h4 A little joke at the end. 33…gxh4 34. a5 DRAW! Let’s glance again at the clocks. They speak for themselves: 0.32 – 1.08! In reality this game was played before, in a correspondence game of home analysis. The best two laboratories in the world studied one and the same line in the opening in parallel. Appearing for the face-to-face game the titans exchanged their ideas and came to a general conclusion – black holds equality in the given variation of the Catalan Defence. Demonstrated and confirmed! I ask that it be entered in the encyclopedia… Working for you, dear viewers, was Grandmaster Sergey Shipov. If only we could all know chess… even a third as well as Anand and Kramnik know it. But it’s extremely difficult to achieve that. You need to study twenty years and analyse the openings for just as long. Life is too short… On that note, goodbye. Tomorrow, Tuesday, we can all rest, while I’ll be waiting for you at 16:30 CET on Wednesday for the start of the fourth round. All the best! When one game finishes early, why can’t Shipov switch to the other one? He sometimes has after really short games, but he probably wants a rest! It must have been really tough to keep up with how quickly they were playing (and try to say something sensible about it). It was certainly near impossible to translate quickly enough! Took me a while. I included the variations. The address for download is on my site. See what you think and make sure it works. Once you’ve taken it over, I will delete the link on my page. So far just game 3. Although your file looks very good there were a few things – the game data at the start needs a little editing and you missed out one or two variations, plus ideally the variations in the text would be clickable rather than having the variations listed afterwards (I don’t know how easy that is to do!). The other thing is I’ll have to check with Crestbook that they’re happy for there to be an English .pgn (or .cbv) file of Shipov’s analysis. So I wouldn’t want to “endorse” it here quite yet, but for anyone looking for a pgn file version they can certainly try the one at your site! And you deserve some traffic for all the effort you’ve put in! (click on “joco” in the comment above to get to the site). You did a terrific job “doing the impossible”! :) Maybe it was good practice for something you apparently don’t do (as paid work): simultaneous translations e.g. at conferences. A wonderful phrase. Thank you for the translations. Thanks – my job’s just to try not to spoil Shipov’s phrases! Thomas, the good thing about it not being simultaneous translation is that I still have a (very brief) chance to check things with Google etc.! A tremendeously good wep page here. Deep insights by Shipov simultaneously and transformed into good english as well. What can we ask for more? Lots of thanks for the great work – Shipov’s analysis and all those wonderful interviews. I’ve edited the TWIC pgn file to incorporate Shipov’s analysis of the six games, variations in the text are clickable, looks ok to me. Can I send them to you so that you can upload them in your site? All the best for the site. Hi, that’s really amazing! Working on the pgn files was near the top of my “to-do” list – I think I’ve worked out how to use a game viewer which will do justice to the games as well. If you click on the “Contact” menu at the top of the page you can use the form to send a message and I’ll e-mail you straight back (if I’m awake/on-line!). Post again here if for some reason that fails.